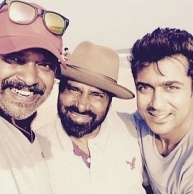 Suriya-Venkat Prabhu’s Masss for Summer! Suriya is currently busy shooting for his upcoming movie, Masss directed by Venkat Prabhu, at Chennai and places around. The Masss team was recently spotted at places like Manapad near Tuticorin, Madurai and also near Thiruchendur. Post that, the team has camped in Chennai now. All the talkie portions are expected to be wrapped up by this schedule with just one song sequence left to be shot post that. Masss will apparently hit the screens for summer 2015 while Yuvan Shankar Raja’s music album can be expected to be released by April end or May. Suriya And Venkat Prabhu's Disapproval On The Prank Played! People looking for online information on Masss, Nayanthara, Suriya, Venkat Prabhu will find this news story useful.